Gray Partridge has a rusty face without a black necklace, a duller bill and reddish bars on the flanks. One of the most commonly kept and bred of all game birds, they are considered as a symbol for the Kurds at Northern Iraq. Chukars are also known as great birds for the beginner in the hobby, being very easy to keep and breed in captivity. There are fourteen recognized subspecies that range from Turkey, the Mediterranean islands, Iraq, Iran and east through Russia and China and south into Pakistan and Nepal. The Chukar has also been successfully introduced into western North America, the Hawaiian Islands, England and New Zealand. Chukars resemble other members of the genus Alectoris, being mostly gray all over with a black band from the eyes, down to below the neck. They also have several black bars on the flanks. The sexes are similar, with the female having a smaller knob on the legs than the males. Males also appear to be somewhat larger as well. Both sexes share the bright red bill and legs. 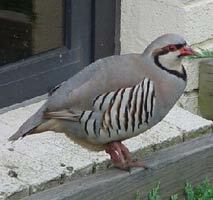 Chukars have been known to hybridize with other members of the genus. Chukars are very versatile breeders in captivity. They can be kept in pairs, trios and even in large colonies. Best fertility is with the smaller groups. Hens begin to lay in April and may lay well into the Summer. Hens may lay a large number of eggs in a season. 40 to 50 eggs per hen is not unusual. Chukars, as a rule, will not usually sit on their own eggs, so you will need to gather the eggs and place them in an incubator. Small bantams may be used, but choose only the smallest hens to set. Incubation lasts about 23 days. Chicks are easy to raise. They are very active and require lots of room in the brooder. They are prone to cannibalism, so don't overcrowd in the brooder. They grow quickly and can be placed outside at about 6 weeks of age. As previously mentioned, Chukars are great birds for beginners as they are so easy to keep and breed. Like most other partridges, Chukars do best when kept in wire-bottom pens. If kept on the ground, they are very susceptible to a number of worms, as well as the disease blackhead. You can keep the birds on the ground if the aviary is well drained and there is no standing water. Chukars are native to dry, rocky areas in the wild, so landscape the aviary accordingly. It is also wise to worm the birds monthly as well. When kept on wire, Chukars are seperated from the organisms in the soil. You can place a pan of sand for the birds to "dust" themselves in. Chukars are very hardy and can withstand both extremes of temperatures. During the Winter, keep as many birds as you can together so they can covey for warmth.